Journal of Young Pharmacists - An official journal of InPharm Association is now fully funded and maintained by Phcog.Net. 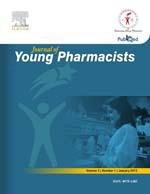 Journal of Young Pharmacists is an official Quarterly Journal published by InPharm Association funded by Phcog.Net. J Young Pharm is a peer-reviewed open-access Quarterly journal featuring research articles of exceptional significance in all areas of Pharmaceutical sciences. J Young Pharm provides comprehensive coverage of issues affecting Pharmaceutical education and Career.